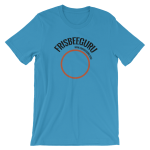 Lisa Hunrichs demonstrates a nice freestyle frisbee combo; the Behind the Back (BTB) rim swoop to a body roll (chest roll). This is a nice combo because the two tricks (BTB swoop and body roll) are performed consecutively. Lisa describes how to do a Window set. This trick is a variation of a with the spin behind the back set. By using the opposite hand to grab your toe in a bad attitude position, you create a hoop, or window. Then as you set the disc it passes through the window. This can be used as a pass or as a set to yourself as Lisa demonstrates in the video.